Biloxi, Miss., is considering the closure of six out of the city’s 29 crossings to accommodate road extensions and is working with CSX to identify the best options. “We share a commitment to safer rail traffic through Biloxi and we’re working on a plan for consolidation that will address our safety concerns while assisting economic expansion in east and west Biloxi,” said Biloxi Mayor Andrew Gilich. The city is working to create two boulevard-style rail crossings in the city, one for the extension for Popp’s Ferry Road to U.S. 90 and another for the Pine Street extension to Back Bay Boulevard, but the growth, according to CSX officials, means that at least six of the city’s crossings may have to close. Biloxi has 20 crossings bunched between Porter Avenue and Oak Street in the east part of town. 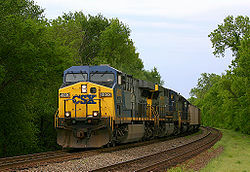 According to CSX, there is an abnormally higher incidence of accidents at city crossings than the Southeastern average. Recently, a soft drink delivery truck was struck by a freight train in downtown Biloxi after getting stuck on the tracks. Gilich met with CSX officials earlier this week as part of an ongoing dialogue about economic development and rail safety throughout the city. No decisions have been made on which crossings could close, as the city awaits information from CSX and traffic counts from Gulf Regional Planning Commission before making recommendations to the city council. Gilich and his administration also have been working with CSX to facilitate development and the return of Amtrak passenger rail service through the Mississippi Coast and to address safety concerns caused by the high number of rail crossings in Biloxi.